AP/J. 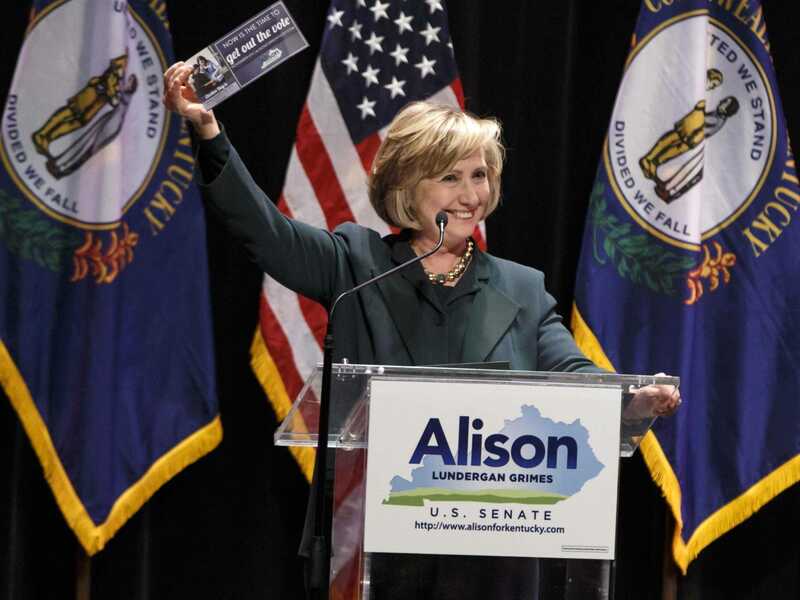 Scott ApplewhiteHillary Clinton campaigns for ex-US Senate candidate Alison Lundergan Grimes. While many Democrats are pointing fingers at President Barack Obama for their stunning midterm losses Tuesday night, Republicans have a different target: the 2016 Democratic presidential front-runner Hillary Clinton. “Good morning, last night Democrat policies were on the ballot and that doesn’t bode well for Hillary and the Democrat 2016-ers. She might try to run from being Obama’s third term but she is very much tied to him on everything from foreign policy to ObamaCare and his flailing economic policy,” Kukowski said. Other Republicans also piled on. “Last night, despite Hillary Clinton being touted as a top surrogate, the candidates she backed got routed, along with the Obama-Clinton-Reid policies they backed. Clinton’s policies and brand are becoming indistinguishable from the President in whose cabinet she served. Heading into 2016, Clinton looks like a candidate from the past who already lost the presidency once, and is running into political headwinds,” the PAC said. Paul also gleefully mocked Clinton in an email to Breitbart News late Tuesday evening. “Somebody should ask Hillary Democrats why they got wiped out tonight. Clearly, Hillary is yesterday’s news,” he wrote. And on CNN’s “New Day” Wednesday morning, Paul immediately declared the results a “repudiation of Hillary Clinton. “The Clintons have long been represented as the leaders of the Democrat Party. She’s said to be the front-runner for the nomination for their party. So really elections are about who the leadership is in a party. And it’s about either accepting or rejecting those leaders. And frankly I think that yesterday was a repudiation of Hillary Clinton. Think about it: 90% of incumbents win, but over 50% of the candidates that she campaigned for, that were incumbents, lost,” Paul said. Paul’s home state of Kentucky hosted a key race where the Clintons attempted to boost the Democratic candidate, Alison Lundergan Grimes, who was running against Senate Minority Leader Mitch McConnell (R). Grimes attempted to separate herself from Obama by declaring herself a “Clinton Democrat” and refused to even say whether she voted for the president in 2012. Paul argued Grimes’ strategy was a failure because the Clinton brand is unpopular. “This was not only a repudiation of the president but I think really a repudiation of Hillary Clinton. Everybody thought, ‘Oh hey, I’m going to be a Clinton Democrat.’ Turns out that’s not so popular in a lot of states either,” he quipped.